From the first Art in the Park of the 56th season (First Saturdays through April – mark your calendar!) to the kick off of a brand new series of make-and-take art projects, plus community events, new exhibitions and the Naples Fall Fine Art and Craft Festival on Thanksgiving weekend, there was something going on at every turn hosted by the Naples Art Association. Here’s a gallery of selected photos taken throughout the month. Special photo credits for some images go to Avant Garde Images and Debi Pittman Wilkey. 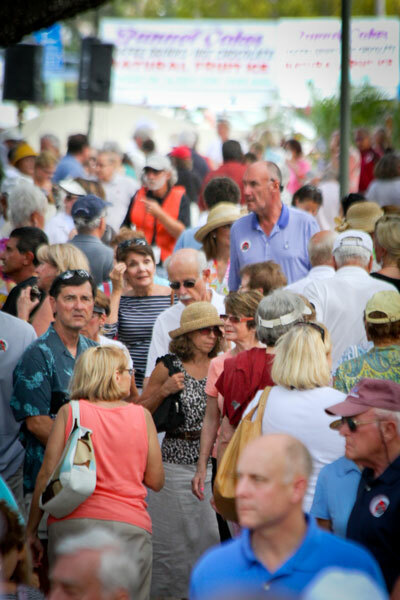 To see even more great photos, visit the Naples Art Association Facebook page. Like us! Nicario Jimenez and Flora Zarate are lending some of their work for the La Casa: Latin American Art, a Naples Art Association exhibition in May. They live together in Eastern Collier and they visited the von Liebig Art Center for the first time. Nicario is a third generation retablo artist working with plaster of paris mixed with potatoes, which are native to Peru. Flora is a fiber artist. Naples Art Association hosted the Young Professionals of Naples, The Young Lawyers of Collier County, The Naples Juniors Women’s Clubs and The David Lawrence Young Executives at the von Liebig Arts Center. It benefitted Friends of Foster Children of Southwest Florida. Technically, this image is from October, but exhibition ran through the month of November – and everyone was excited about the bright yellow wall that welcomed guests to the Watson Gallery. Hundreds turned out for the Faculty Biennial preview reception, and hundreds more saw it during events held in the gallery during November. Executive Director Aimee Schlehr greets artists at the festival. Bob Kemp of the Marine Corps invites attendees to bring and donate a new, unwrapped toy or cash to help make the holidays a little brighter for families in needs. A great crowd shopping for beautiful artwork and incredible weather! Photographer Geoff Coe talks with a guest about his work. A new evening workshop, Wine and Dezine, kicked off on Nov. 8. Instructor Anne Chaddock led students in painting gorgeous tulip masterpieces. Early bird shoppers found just what they were looking for. Artist Tara ONeill and her friend Claire Keery who stopped by her booth. Susan Stanley and Judy Chinski visited with guests to tell them more about the Naples Art Association at the NAA Booth.